Skechers U.S.A. Inc., TiVo Corp., and other California-based companies that have only men on their boards would need to add at least one woman under a bill being considered in the state’s legislature. California would be the first state in the nation with such a requirement for publicly held companies, if the state Senate proposal passes. So far, it’s been approved 5-1 by one committee and is headed to another committee April 24 before it can go to a vote on the Senate floor. The state Assembly would also need to vote for the bill to send it to the governor’s desk. Countries such as Norway, France, and Germany already use gender diversity quotas to bring more women into boardrooms. There are no similar quotas in the U.S., though some states, including California, have adopted nonbinding resolutions urging companies to diversify their boards. The bill (SB 826) would put more force behind the effort by requiring that public companies headquartered in California have at least one woman on their boards of directors by the end of 2019. Companies would need to have at least two or three female directors, depending on their board’s size, beginning in 2021. 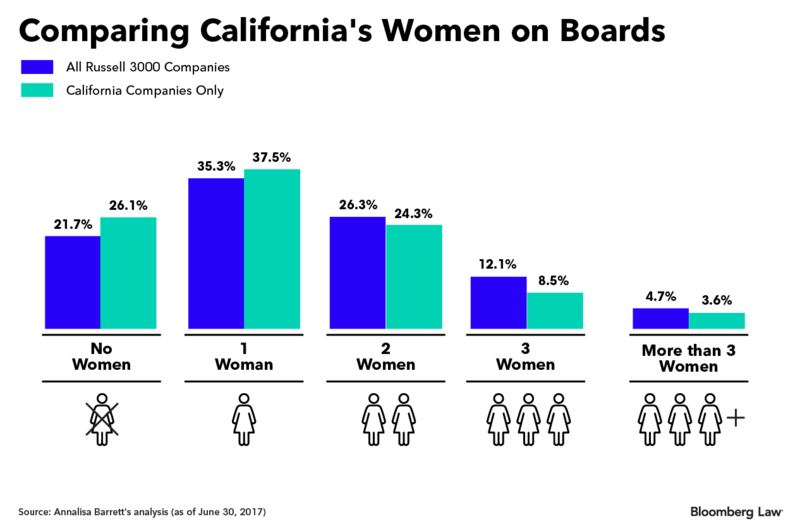 There are more boardrooms without women in California than across the U.S. as a whole, according to research by Annalisa Barrett, who teaches finance at the University of San Diego. Her analysis found that about 22 percent of companies in the Russell 3000 index had all-male boards in 2017. That percentage was slightly higher, about 26 percent, for the 445 California-based companies in the index. “They are operating without the benefit of the experience, perspective, and tools that women bring with them to the boardroom,” California state Sen. Hannah-Beth Jackson (D), who authored the bill, told Bloomberg Law. Most California companies had one woman on their boards at the time of Barrett’s research. Guess? Inc. and Pandora Media Inc. are among those that still have one female director today. Studies by the Boston Consulting Group, Credit Suisse, and McKinsey & Co. have shown that companies with more diverse management teams and boards perform better financially. “So we effectively are inhibiting our own economic performance as a state,” Jackson said. Other groups led by the California Chamber of Commerce have come out against the bill, saying it only considers one part of diversity, and ignores others such as race or national origin, and could displace existing board members based solely on their gender. These groups have also raised concerns about the constitutionality of such a requirement. The bill would tell companies to add board seats for women, rather than boot men, if they don’t have any spots open up before the deadline. Companies that don’t comply would have to pay a fine equal to their directors’ average cash compensation for one year, which Berkhemer-Credaire said is meant to symbolize what the board would have paid a woman had they given her a seat. California was the first state to issue a resolution calling on companies to improve the gender diversity of their boards in 2013. Illinois, Massachusetts, Colorado, and Pennsylvania followed. Companies’ largest shareholders, including BlackRock Inc. and State Street Corp., are also throwing their weight behind gender diversity on boards. More than 150 of the roughly 700 companies that State Street targeted for having no women on their boards have since added a female director.